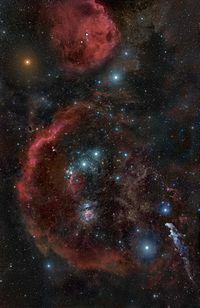 Betelgeuse, also designated α Orionis (Latinised to Alpha Orionis, abbreviated Alpha Ori, α Ori), is on average the ninth-brightest star in the night sky and second-brightest in the constellation of Orion (behind Rigel). It is a distinctly reddish, semiregular variable star whose apparent magnitude varies between +0.0 and +1.3, the widest range of any first-magnitude star. 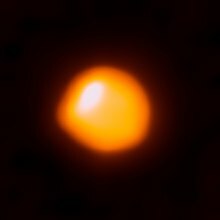 At near-infrared wavelengths, Betelgeuse is the brightest star in the night sky. Classified as a red supergiant of spectral type M1-2, the star is one of the largest stars visible to the naked eye. If Betelgeuse were at the center of the Solar System, its surface would extend past the asteroid belt, completely engulfing the orbits of Mercury, Venus, Earth, Mars, and possibly Jupiter. 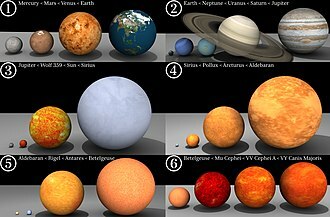 However, there are several other red supergiants in the Milky Way that are larger, such as Mu Cephei and VY Canis Majoris. Calculations of its mass range from slightly under ten to a little over twenty times that of the Sun. 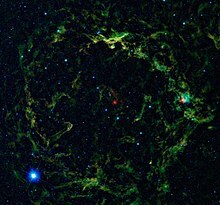 It is calculated to be 640 light-years away, yielding an absolute magnitude of about −6. Less than 10 million years old, Betelgeuse has evolved rapidly because of its high mass. 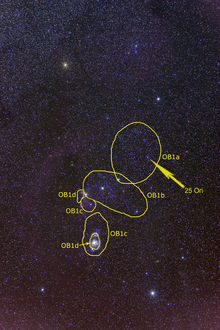 Having been ejected from its birthplace in the Orion OB1 Association—which includes the stars in Orion's Belt—this runaway star has been observed moving through the interstellar medium at a speed of 30 km/s, creating a bow shock over four light-years wide. 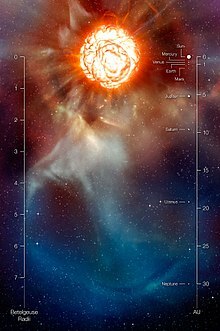 Betelgeuse is in the last stages of its evolution, and it is expected to explode as a supernova within the next million years. In the 1970s, astronomers saw some major advances in astronomical imaging technology, beginning with Antoine Labeyrie's invention of speckle interferometry, a process that significantly reduced the blurring effect caused by astronomical seeing. It increased the optical resolution of ground-based telescopes, allowing for more precise measurements of Betelgeuse's photosphere. 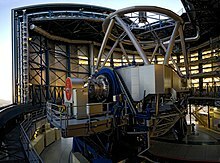 With improvements in infrared telescopy atop Mount Wilson, Mount Locke and Mauna Kea in Hawaii, astrophysicists began peering into the complex circumstellar shells surrounding the supergiant, causing them to suspect the presence of huge gas bubbles resulting from convection. 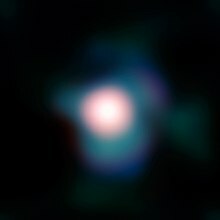 But it was not until the late 1980s and early 1990s, when Betelgeuse became a regular target for aperture masking interferometry, that breakthroughs occurred in visible-light and infrared imaging. Pioneered by John E. Baldwin and colleagues of the Cavendish Astrophysics Group, the new technique employed a small mask with several holes in the telescope pupil plane, converting the aperture into an ad-hoc interferometric array. 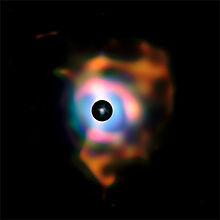 The technique contributed some of the most accurate measurements of Betelgeuse while revealing bright spots on the star's photosphere. 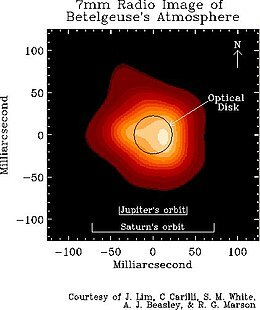 These were the first optical and infrared images of a stellar disk other than the Sun, taken first from ground-based interferometers and later from higher-resolution observations of the COAST telescope. The "bright patches" or "hotspots" observed with these instruments appeared to corroborate a theory put forth by Schwarzschild decades earlier of massive convection cells dominating the stellar surface. 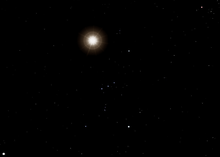 Due to its distinctive orange-red color, Betelgeuse is easy to spot with the naked eye in the night sky. It is one of three stars that make up the Winter Triangle asterism, and it marks the center of the Winter Hexagon. At the beginning of January of each year, it can be seen rising in the east just after sunset. Between mid-September to mid-March (best in mid-December), it is visible to virtually every inhabited region of the globe, except in Antarctica at latitudes south of 82°. In May (moderate northern latitudes) or June (southern latitudes), the red supergiant can be seen briefly on the western horizon after sunset, reappearing again a few months later on the eastern horizon before sunrise. In the intermediate period (June–July) it is invisible to the naked eye (visible only with a telescope in daylight), unless around midday (when the Sun is below horizon) on Antarctic regions between 70° and 80° south latitude. Betelgeuse is a variable star whose visual mgnitude ranges between 0.0 and +1.3. There are periods when it will surpass Rigel to become the sixth brightest star, and occasionally it will be even brighter than Capella. 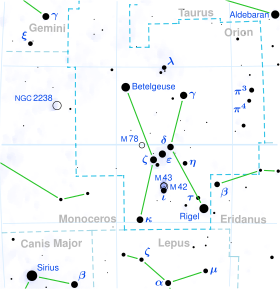 At its faintest Betelgeuse can fall behind Deneb and Beta Crucis, themselves both slightly variable, to be the 20th-brightest star. 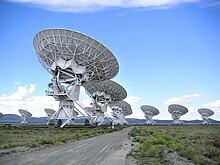 In 2004, a team of astronomers working in the near-infrared announced that the more accurate photospheric measurement was 43.33 ± 0.04 mas. The study also put forth an explanation as to why varying wavelengths from the visible to mid-infrared produce different diameters: the star is seen through a thick, warm extended atmosphere. At short wavelengths (the visible spectrum) the atmosphere scatters light, thus slightly increasing the star's diameter. At near-infrared wavelengths (K and L bands), the scattering is negligible, so the classical photosphere can be directly seen; in the mid-infrared the scattering increases once more, causing the thermal emission of the warm atmosphere to increase the apparent diameter. Central to this discussion, in 2009 it was announced that the radius of Betelgeuse had shrunk from 1993 to 2009 by 15%, with the 2008 angular measurement equal to 47.0 mas, not too far from Perrin's estimate. Unlike most earlier papers, this study encompassed a 15-year period at one specific wavelength. Earlier studies have typically lasted one to two years by comparison and have explored multiple wavelengths, often yielding vastly different results. 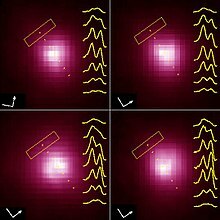 The diminution in Betelgeuse's apparent size equates to a range of values between 56.0 ± 0.1 mas seen in 1993 to 47.0 ± 0.1 mas seen in 2008—a contraction of almost 0.9 AU in 15 years. 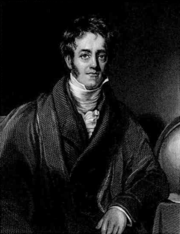 What is not fully known is whether this observation is evidence of a rhythmic expansion and contraction of the star's photosphere as astronomers have theorized, and if so, what the periodic cycle might be, although Townes suggested that if a cycle does exist, it is probably a few decades long. Other possible explanations are photospheric protrusions due to convection or a star that is not spherical but asymmetric causing the appearance of expansion and contraction as the star rotates on its axis. ^ a b c d e Neilson, H. R.; Lester, J. B.; Haubois, X. (December 2011). 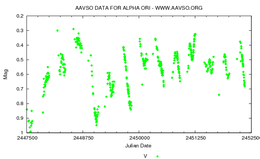 Weighing Betelgeuse: Measuring the Mass of α Orionis from Stellar Limb-darkening. 9th Pacific Rim Conference on Stellar Astrophysics. Proceedings of a conference held at Lijiang, China in 14–20 April 2011. ASP Conference Series. Astronomical Society of the Pacific. 451. p. 117. arXiv:1109.4562. Bibcode:2011ASPC..451..117N. ^ a b Levesque, E. M. (June 2010). The Physical Properties of Red Supergiants. Hot and Cool: Bridging Gaps in Massive Star Evolution ASP Conference Series. Astronomical Society of the Pacific. 425. p. 103. arXiv:0911.4720. Bibcode:2010ASPC..425..103L. ^ a b c Kervella, P.; Perrin, G.; Chiavassa, A.; Ridgway, S. T.; Cami, J.; Haubois, X.; Verhoelst, T. (2011). "The close circumstellar environment of Betelgeuse". Astronomy & Astrophysics. 531: A117. doi:10.1051/0004-6361/201116962. ^ a b Mohamed, S.; Mackey, J.; Langer, N. (2012). "3D Simulations of Betelgeuse's Bow Shock". 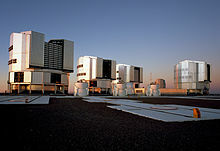 Astronomy & Astrophysics. 541: A1. arXiv:1109.1555. Bibcode:2012A&A...541A...1M. doi:10.1051/0004-6361/201118002. 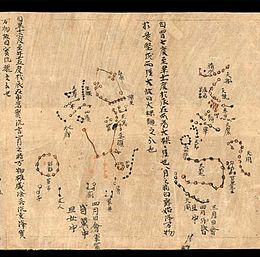 This page was last edited on 26 April 2019, at 15:33 (UTC).